Alpena celebrates senior Mollie Girard's buzzer-beater halftime 3-pointer on senior night. 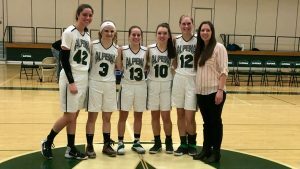 Alpena, Mich. — The Alpena Wildcats hosted the Petoskey Northmen for senior night. This game marked one of Alpena’s last three matches of the regular season before Districts. The Wildcats defeated Petoskey earlier this season the road. Head Coach Erin Andrews started all five Wildcat seniors for the first three minutes of the first quarter. The seniors jumped out to an early 7-5 lead before going up 12-7 after one. The momentum changer of the game happened with less than two seconds in the half. Alpena senior guard Mollie Girard fired from behind the arc and scored the 3-pointer for the buzzer-beater halftime 18-12 lead. 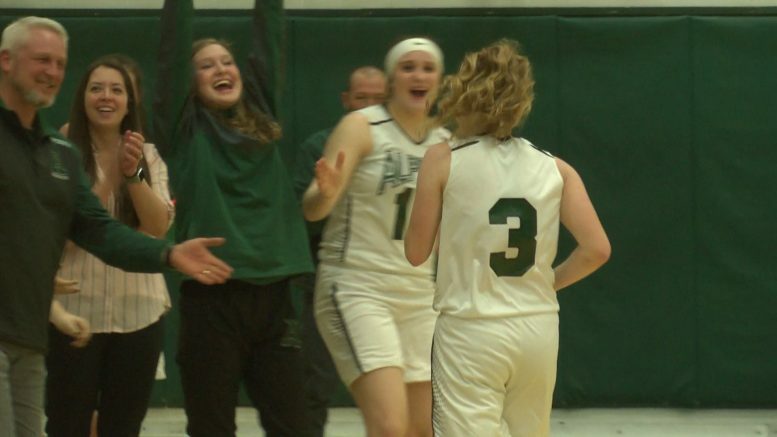 Alpena Junior Macy Dickinson added another buzzer-beater 3-pointer to end the third quarter helping the Wildcats crusied to a 41-25 victory over the Northmen. Alpena improved to (10-8) overall and (4-4) in the Big North Conference sitting in third. Up next, Alpena hosts Gaylord on Thursday at 7 p.m. Then on Friday the Wildcats take on Traverse City Central in Alpena at 5 p.m. for the last regular season game of the year. The green and white host Marquette for round one of Districts on Monday, March 4th at 6 p.m.